Technical Car Experts Answers everything you need: replace wastegate but still 0243 code on 2003 pt cruiser? replace wastegate but still 0243 code on 2003 pt cruiser? Sound like the wastegate is not opening. 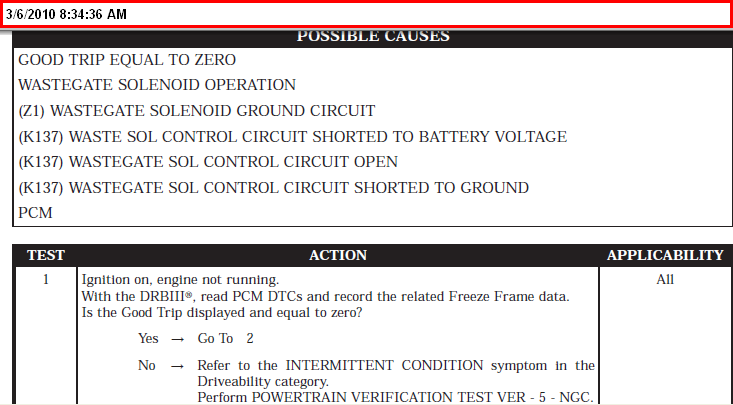 OK.replaced solenoid but still the same error, what to do. Try reseating the electrical connectors on the solenoid. There are three solenoids on a bracket near the cruise control mechanism. The one marked #2 is the wastegate solenoid. What do you mean by "visually working"? You can't see anything moving when the solenoid is operating...or isn't operating. Did you try reseating the PCM connections? With the engine running... the actuator will open and close when the engine is revved... and yes i did try reseating. The wastegate actuator should always open and close with the revving, even if the wastegate solenoid is broken. The engineers designed it so that if the solenoid fails the failsafe state is to route the pressure line to the wastegate actuator. Otherwise the car would overboost and possibly do some big damage with a malfunctioning solenoid. Sounds like the coil in the wastegate solenoid might be shot. You can temporarily swap one of the other solenoids with the wastegate solenoid and see what changes. Try the TIP solenoid. If that is the problem, I think the solenoids are not too expensive. UPDATE: Today i hooked up a boost gauge and was only boostin at 4psi in 2nd gear. I swapped out the #2 solenoid with a solenoid from an srt4 and reset the computer but resulted in no change. I installed a manual boost controller in place of the solenoid and am now boosting at 11 psi (spike 15 psi) but still have a check engine light. Try reseating the connectors on the PCM. Do this with the battery disconnected. 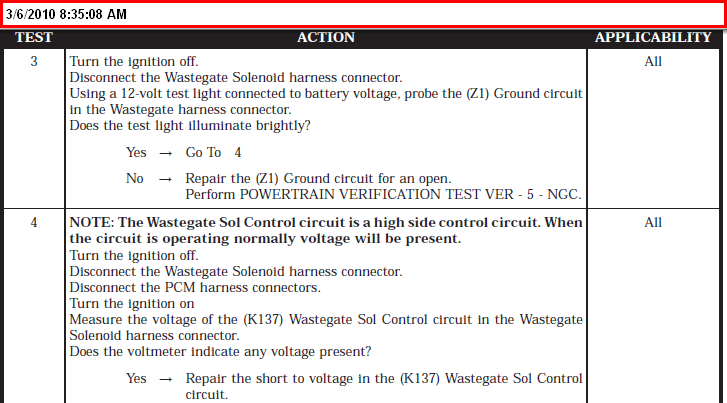 Maybe there is trouble in the harness of rthe I/O to the PCM. PROBLEM FIXXED!!!! after quickly looking at a wiring diagram i found that the black wire is supposed to be a ground.. yet it is not grounded when i test it... so i simply re-grounded it and light is gone. The problem was ground getting loose. Diagnosis: When I got home I scan for codes, and came up with P0243. Pop the hood, and noticed the Throttle Actuator in the open position. I had my wife watch the butterfly as I started the car and rev the engine to about 3k – 4k RPM’s. And she said the flap did not move from its current position. As I looked into the engine bay, I saw a thin -loose vacuum tube disconnected from the SC (the one that connects to the air box). I reconnected it, cleared the code, and took the car around the block. The whine of the SC was alittle louder, but not like before. I notice alittle bit more power as well, and no CEL. But, I knew it still was not operating properly.BUT CODE WAS CLEARED. Labels: replace wastegate but still 0243 code on 2003 pt cruiser.